At a time when overindebted governments are making increasingly desperate grabs for their citizens’ money, keeping all your assets invested in one country—and denominated in one currency—is a very bad idea. Do you have a bank account in another country? If not, you should hurry up & get one. Holding foreign currencies in an account outside of the United States is the way to go if you REALLY want to diversify your assets internationally—but in the last few years the US government has left no stone unturned to make it harder for investors to get a foreign bank account. It’s not too late, though—there are still feasible ways to open one. But you have to act quickly, before Washington enacts even stricter controls in a desperate grab for your money. Most people know of the general investment benefits of not having all your asset eggs in one basket. This portfolio-diversification concept—investing in multiple asset classes—also applies to the political risk associated with your home country. It is a risk few people think about diversifying. In short, internationalization is prudent because it frees you from absolute dependence on any one country. Achieve that freedom, and it becomes very difficult for any country to control you. While diversifying political risk is something that everyone in the world should strive to achieve, it goes double for those who live under a government that is sinking deeper into fiscal trouble (e.g., most Western governments). Here are a few compelling arguments on why you should diversify, diversify, diversify—across different countries, exchanges, currencies, banks, and asset classes. Harvard Economists Carmen Reinhart and Ken Rogoff suggest debt write-downs and ‘financial repression’, meaning the use of a combination of moderate inflation and constraints on the flow of capital to reduce debt burdens. A study from the IMF: The tax rates needed to for a sample of 15 euro area countries is 10% on households with a positive net worth. Note: The tax would apply to anyone with a positive net worth. And the 10% wealth-grab would, of course, be on top of regular income taxes, sales taxes, property taxes, etc. A subtle type of debt restructuring takes the form of ‘financial repression.’ Financial repression includes directed lending to government by captive domestic audiences (such as pension funds), explicit or implicit caps on interest rates, regulation of cross-border capital movements, and (generally) a tighter connection between government and banks. “Directed” means “compulsory” in the above statement, and you may not have a choice if “regulation of cross-border capital movements”—capital controls—are instituted. The savings of the European Union’s 500 million citizens could be used to fund long-term investments to boost the economy and help plug the gap left by banks since the financial crisis. EU officials are explicitly telling us that the pensions and savings of its citizens are fair game to meet the union’s financial needs. If you live in Europe, the writing is on the wall. Actually, it’s already under way… Reuters recently reported that Spain has introduced a blanket taxation rate of .03% on all bank account deposits, in a move aimed at… generating revenues for the country’s cash-strapped autonomous communities. A bail-in is what they call it when a government takes depositors’ money to plug a bank’s financial holes—just as was done in Cyprus last year. The bank can be recapitalized and returned to viability through the very rapid conversion of certain bank liabilities into regulatory capital. What’s a “bank liability”? Your deposits. Have you considered why the Foreign Account Tax Compliance Act was passed into law? It was supposed to crack down on tax evaders and collect unpaid tax revenue. However, the result of FATCA keeps US savers trapped in US banks and in the US dollar, where the US could implement a Cyprus-like bail-in. Given the debt load in the US and given statements made by government officials, this seems like a reasonable conclusion to draw. 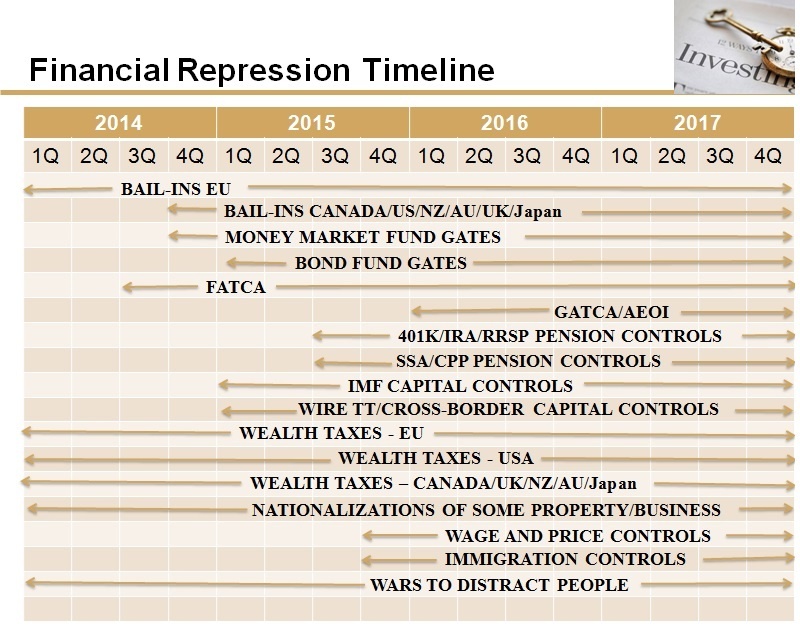 This entry was posted in Americans, Bail In, Banks, Capital Controls, Debt, Deceptions, Disaster, Education, Expats, FATCA, For Seniors, Government, Green Card Holders, IMF, IRS, Pensions, Retirement, Strategy, Tax, Uncategorized, US shareholders, USD by Adrian Rowles. Bookmark the permalink.